Vintage bike or vintage rider? Perhaps as a sort of voodoo ritual to ward off advancing decline, I have regressed to a point more than 30 years ago. I’ve registered to race. The impulse was generated watching my son-in-law, not that many years my junior, race cyclocross these past two seasons. In Oregon and elsewhere, cyclocross is not the serious, but somewhat less demanding, off-season sport for amateurs and pros. Here, it is part race, part side show and part beer bash. Occasionally, there is a costume party. The more I observed, the more I became curious and, perhaps in a misguided way, thought that I might be able to compete. I then realized that I would need a cyclocross bike since none in the stable are really capable of being raced through the mud and muck of that kind of course. Since these impulses typically occur at the end of the season, it was obvious that the racing bug would have to wait for a new bike and another year or . . . .
Sign up for some other kind of racing. The obvious and surely the safest would be the time trial. Lucky for me, a local clinic is offered in just two weeks. I quickly registered with the local sanctioning body, Oregon Bicycle Racing Association, booked a spot in the clinic and promptly, and coincidentally, caught a bad cold. Holidays and the cold interrupted a decent jump on off-season training, so I looked a bit farther down the calendar. And, there it was. The Gorge Roubaix. The name implied, and the description of the course confirmed, that this was a race partially over rough roads, the Oregon version of the strade bianchi. With more than three months in front of me, I figured what could be more suitable? And, there was always the option of violating a Velominati rule of some kind, wimping out and riding the difficult Fondo version of the race, the Gorge Gravel Grinder, on Sunday. Now, I find myself in that somewhat terrified state of four years ago when I registered for l’Eroica. I’ve signed up for something that I’m not really sure suits me. Will I be pushing my 2-wheeler up a dusty gravel track, wondering whether I’ll get back to the starting line before dark? Or, will I find myself under a pile of carbon, aluminum and steel in some crucial turn near the end? Perhaps a pile up caused by my own lack of experience? More to follow. Stop. Before you read any implied criticism in the title, it is not meant to be. It’s merely a statement of fact or at least my observations. And here’s why. According to what I’ve heard from a reliable source and fellow lungo percorso finisher, Brooks England have “purchased” l’Eroica from Giancarlo Brocci and his group. I cannot verify a transaction and perhaps it’s merely the licensing of the brand, but Eroica Brittannia is the first “brand extension” that was made. 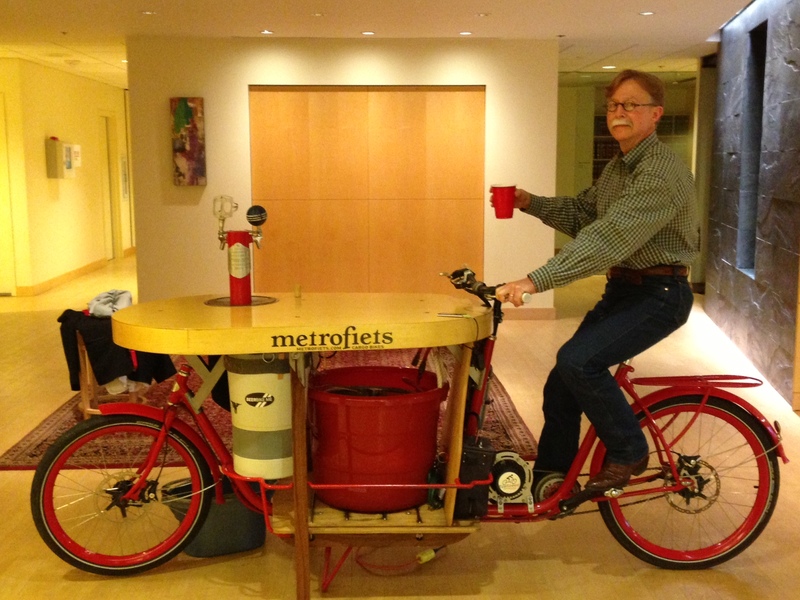 The inaugural ride was earlier this year. On the heels of my learning about this purchase, I was alerted to the coming of Eroica to California. Need more proof? Just click on the link in the Blog Roll here and see what’s in store for the rest of the world. Do I find this exciting, troubling, beneficial? Maybe all of those reactions and more. In some sense, l’Eroica can only be the event held in October in Tuscany where the old roads (strade bianchi) and the old way of life are celebrated. In another sense, why not gather enthusiasts to experience a bit about what riding was like before carbon fiber monocoque frames and clipless pedals. It’s not as if this is the only vintage or retro ride in the world. La Mittica, Retro Ronde and La Pedals de Clip are just a few on the European continent. My reliable source, cited above, asked me why we shouldn’t have such a ride here (Oregon, United States). He was suggesting that perhaps he and I could somehow inspire others to actually put together something like l’Eroica. Perhaps he wasn’t counting the Gorge Roubaix race and Fondo to be held in the spring with 40% of the ride running over gravel roads in the ranch country of eastern Oregon. 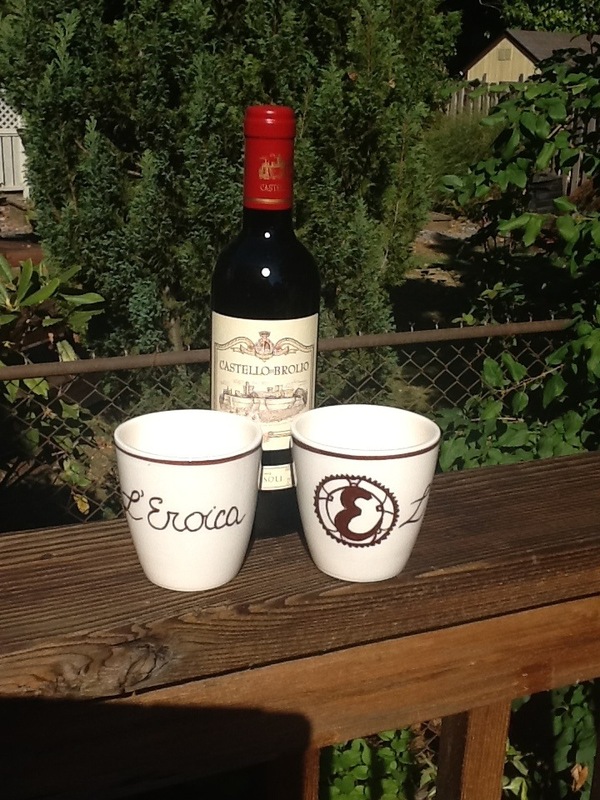 A benefit of multiple “Eroica” rides means it perhaps takes the pressure off of l’Eroica hosting so many people. Of course, those of us who have ridden l’Eroica will probably claim that no matter what Eroica sponsored ride you participate in, you can never claim pilgrimage or full palmarès until you have ridden from Gaiole on the first Sunday in October. Testing my 2015 entry for a l’Eroica support vehicle. 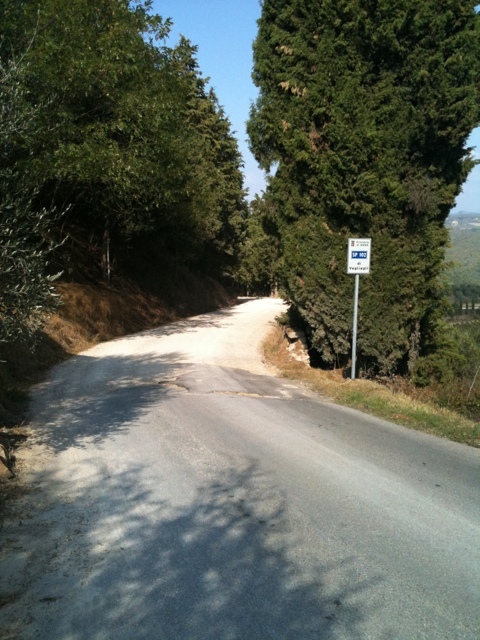 I keep reminding myself that it was this time last year, 2011, that I was waking up in Lecchi-in-Chianti, enjoying the sunshine and blue skies and nervously looking forward to my first ride on the strade bianchi. I had scouted a short, 30K route that made a loop from our rental home and traversed what I later learned was part of one of the shorter rides that year. Signs declaring 15% grades with falling stones were foreboding, but after a few slips and slides, I came to love the white gravel. I returned to the house after that first ride believing I knew what lay ahead, even if it was to be 5 times the distance. For those lucky riders planning to participate this year, spend some training time on the gravel if you don’t normally get to ride it. And, don’t forget to look up and enjoy the incredible scenery that surrounds the L’Eroica route. 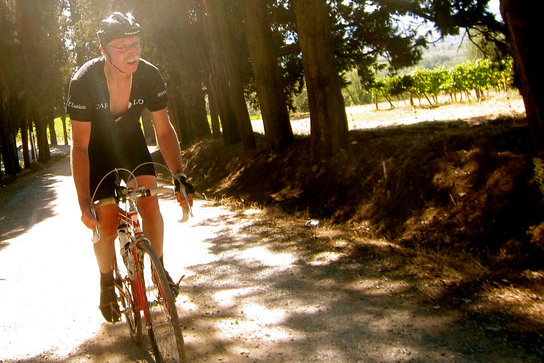 Riding over the strade bianchi leaves more than just a satisfying impression and memory. Your bicycle collects a little bit of that history as either dust or mud or both. The 2011 version of L’Eroica was run under blue skies after more than a week of clear, autumn weather that hovered in the mid 80’s (High 20’s C). This left the white roads powdery on top of the stones. My several training rides included time on the gravel and often over some of the same sectors that I would enjoy on the day of the ride. I developed several layers of the buff-colored dust on my kit and the various frame parts and components. It was easy to submit my jersey and shorts to the washing machine. I couldn’t bring myself to wipe the dust off the bike. I’ve heard that athletes are superstitious, baseball players being overachievers in that department. I don’t think of myself as an athlete, but I am sharing that particular characteristic. I don’t know what I imagine might happen if I remove the fine dust from a down tube or a chain stay, but I cannot seem to do it. Sure, the Moseman would benefit from a thorough cleaning. And, I’ve been careful to keep the drivetrain in good shape. But, that dust. It just won’t come off the rest of the bike.